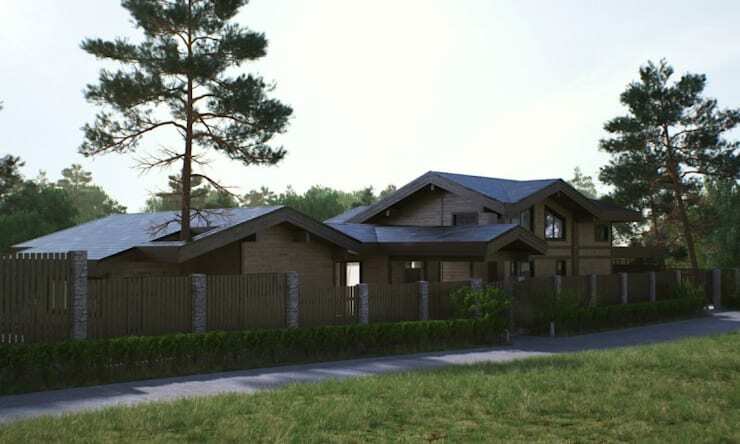 Today, we are going to explore a beautiful home – with plans – designed by professionals Meta Architects. This country house by the water is incredibly stunning – but involved a lot of strategy and hard work. As the architects have explained, The complexity here is not so much in the proximity of the water, but in terrain characteristics. Our task was to design a house that was supposed to stay in the slope. The designers found an impressive solution. They ensured that the main facade faced the water, with the interiors spilling out onto two spacious terraces. The one terrace creates the impression of being close to the water. The back of the house features the main entrance as well as a carport for vehicles. The house features two floors and includes a basement. While we won't get a chance to go into the home, we will be able to see the plans! The home features a fabulous entrance hall with a glass facade that allows panoramic views of the water. 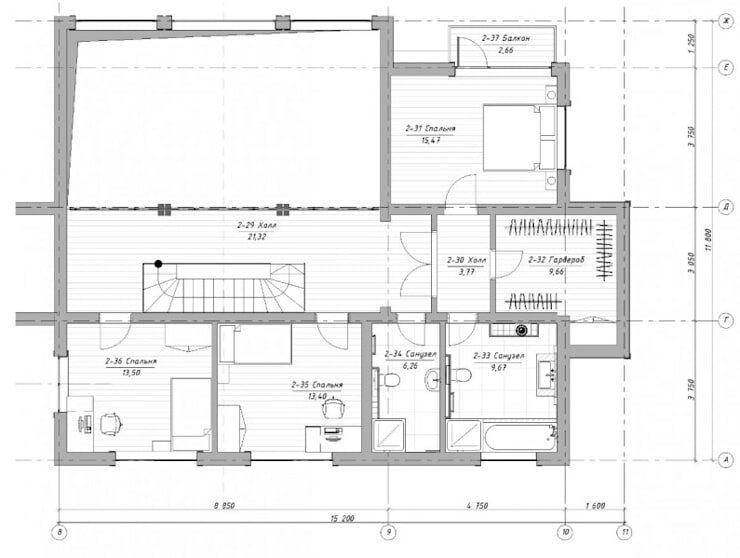 The living spaces feature a living room, study and kitchen while the upper floors feature the bedrooms. The floors are connected by an open stairwell. The base of the home is made from reinforced concrete, while the structure is built with a laminated wooden frame. The wood catches the eye from the very first glance, merging rustic beauty with contemporary style. Here we can see how the back area of the home is just as impressive as the structure itself. 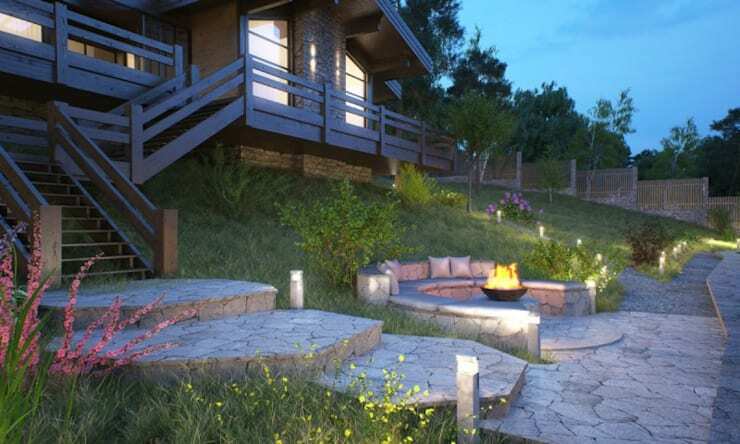 Large stone steps lead up to the terrace while a little stone bench and fire pit create a cozy nook for relaxing under the stars or admiring the water. 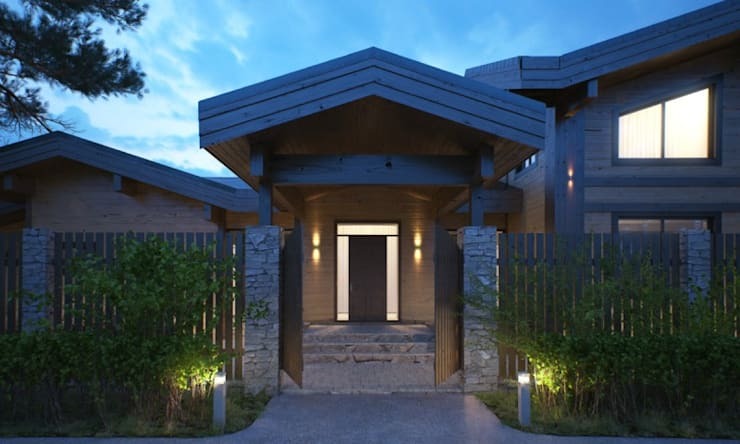 The outdoor lighting really enhances the details of the exterior design, illuminating the stone and the wood. It also ensures that these outdoor space can be utilized in the evening. 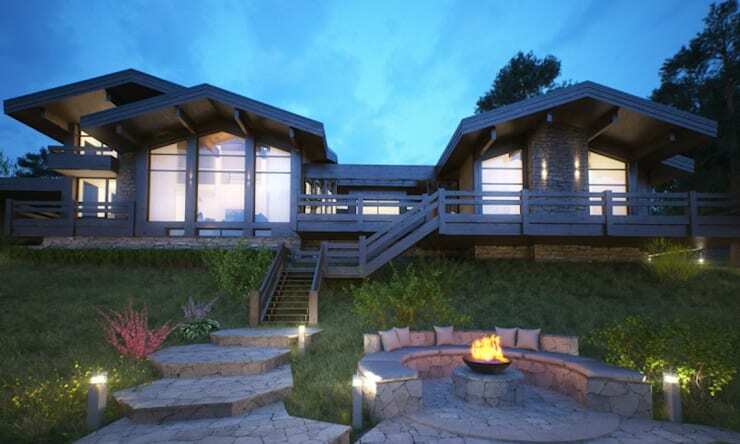 From this angle, we can see how the designers have worked with the slope of land that is available, ensuring that the home juts out over the water. The terraces thus seem that much closer to the river! The way that this structure is built around the tree is a wonderful example of how the designers have truly worked in harmony with the nature that surrounds the home. The architecture thus complements the beauty of the surrounds, while the natural landscape enhances the architecture. 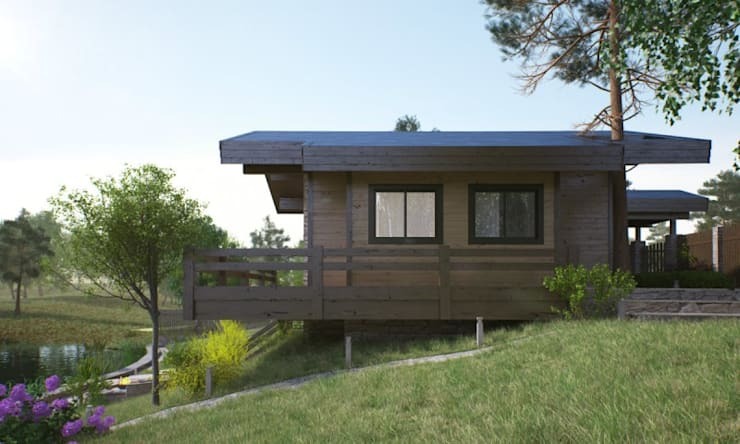 The result is a peaceful rustic setting with all of the modern comforts! The home spills out onto the river, but from this angle we can see that it is quite private and discreet. It is truly a haven that a family can escape to. The front entrance is also private and secure, but welcomes guests, family and friends in. The lighting creates a clear path while the wood and stone works with the beautiful greenery for a very welcoming and earthy design. Do you see how well stone and wood work together? 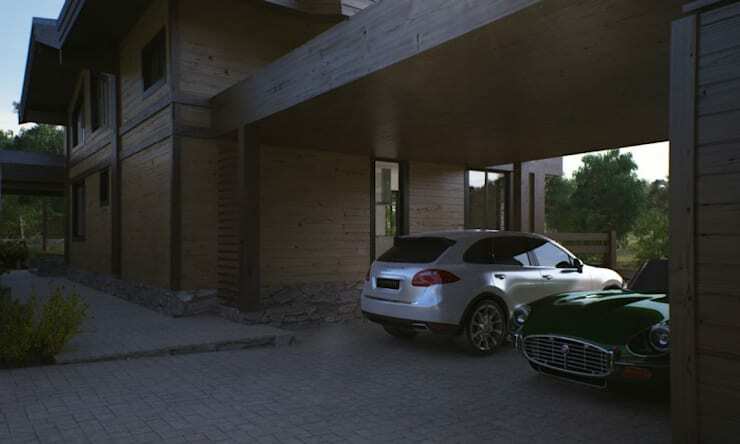 The car port is simple yet sleek, providing plenty of sheltered space for cars. This keeps them protected from rain or the heat. Finally, we get a chance to the see the house from the angle of the water. The large glass windows and doors ensure that the family have panoramic views of the river and that sunlight streams into the interior spaces throughout the day. 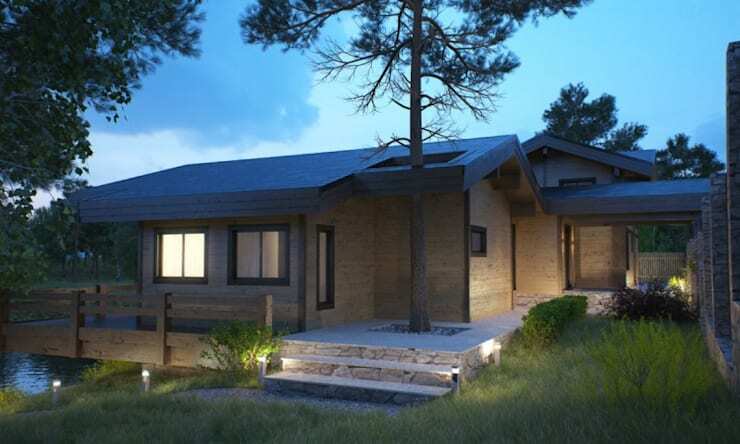 Couldn't you imagine relaxing outdoors and enjoying the nature that surrounds this home? 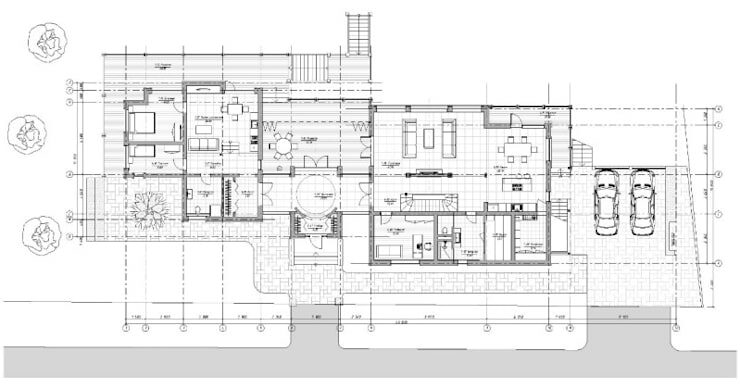 These ground floor plans give us an idea of just how much detail, thought and precision went into this design. Every area has been carefully planned and laid out. We can see how the ground floor features plenty of living spaces for the family, making for an interactive and social environment. The upstairs section of the home features plenty of bedroom space for the entire family. 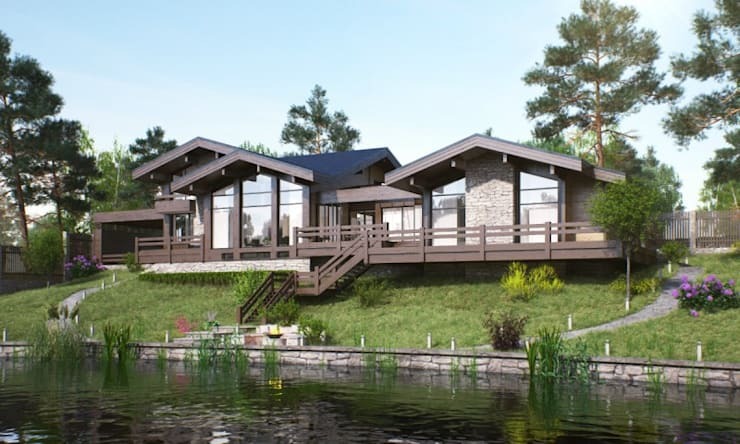 This is truly a house that you can escape to, enjoying nature, fresh air and the peaceful sound of the river. If you've enjoyed exploring this home, you have to see this riverside home you'd love to relax in. Are you impressed with this home?